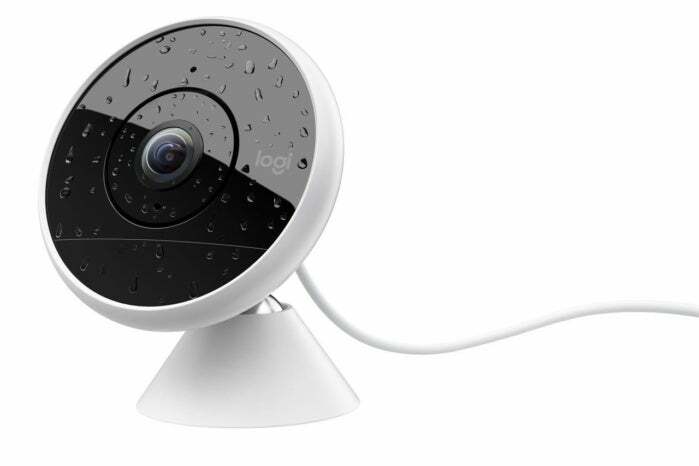 The Circle 2, Logitech’s second iteration of its Circle home security camera, is not a single camera but two separate models: the Circle 2 wired (about $180 at Amazon) and the Circle 2 wire-free (about $200 at Amazon). Both cameras are designed for indoor/outdoor use and they share the same core features. We reviewed the wired model, and if it’s any indication, both also dramatically improve on the shortcomings of the original Logitech Circle. The Circle 2 wired—which gained Apple HomeKit compatibility after we put this review to bed—is a complete cosmetic makeover of the original. The ball-and-charging-ring design is gone, replaced with a cone-shaped camera unit on an articulating stand. The broad, flat face and triangular body give the camera a much sleeker look than its predecessor. But don’t be fooled—it’s rugged, too, with an IP65 weatherization rating. That means it’s impervious to dust, it can withstand blasts of water from a garden hose, and can tolerate temperatures from -4 degrees to 122 degrees F.
The Circle 2 includes significant upgrades to the core technology as well. It boasts a 180-degree field of view—a big bump from the original’s 135-degree angle—and up to Full HD 1080p resolution, bettering the first Circle’s 720p max. Holdovers from the original include motion detection, up to 15 feet of night vision, and two-way audio. The Logitech Circle 2 can be used indoors or outdoors. Out of the box, the Circle 2 comes with 24 hours of free storage for your surveillance video clips. If you're using a single camera,you can extend that with a Circle Safe subscription for $4 per month or a Circle Safe Premium subscription for $10 per month ($100 per year). The Premium subscription will also unlock advanced security features, including person detection, smart-alert filters, and the ability to set motion zones. Multi-camera households with up to five Circles can choose a Circle Safe Basic Home plan for $7 a month or $69 a year, or a Circle Safe Premium Home subscription for $18 per month or $179 per year. Logitech also offers a trio of accessories for the Circle 2, each sold separately. 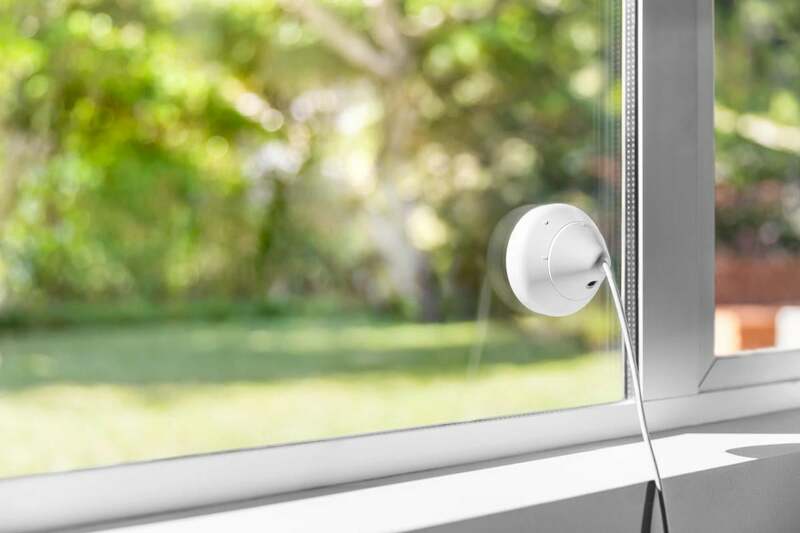 A Window Mount ($40, or $20 right now on Amazon) affixes the camera to any window pane, so that you can monitor outside your home without having to actually place the camera outdoors. A plug mount ($50, or $30 on Amazon) lets you plug the Circle 2 directly into an electrical outlet without the power cord. A weatherproof extension ($30) lengthens the power cord for indoor or outdoor use. One of the strengths of the original Circle was its exceedingly easy setup, a feature the Circle 2 shares. 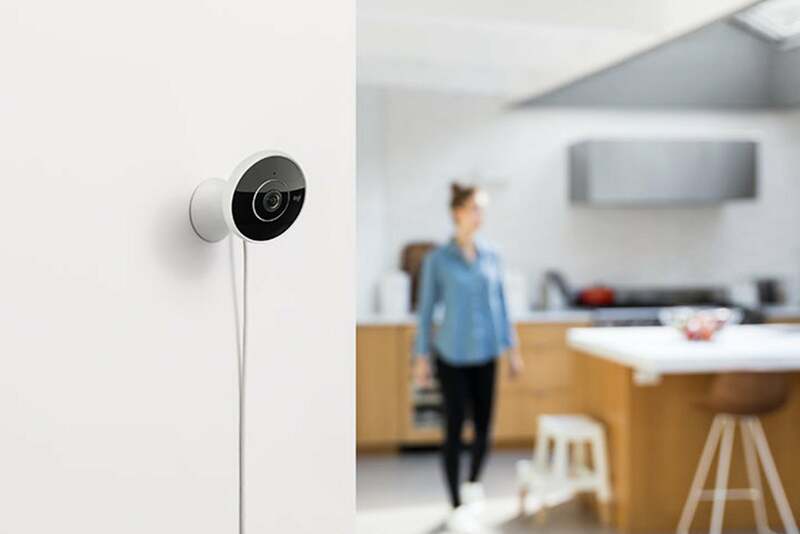 All that’s required is to attach the camera to its stand, plug it in, and follow the Logi Circle app’s prompts to pair the cameras and connect it to your Wi-Fi network. In less than five minutes, I was looking at a streaming feed of my living room. 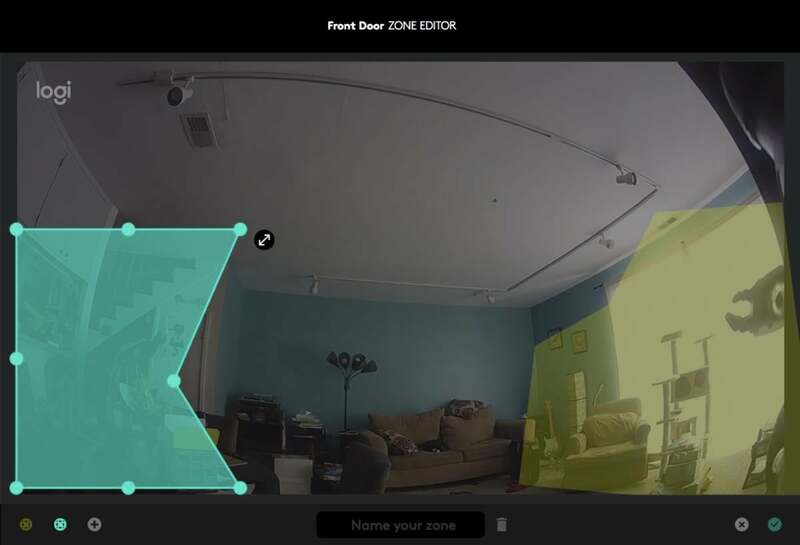 You can customize motion zones to narrow detection areas. This wired model comes with a 10-foot power cord, so there’s a lot of latitude for placement on shelves or tabletops. The camera also includes a wall bracket, screws, wall anchors, and cable clips for mounting to interior or exterior walls. The 180-degree field of view is plenty for an average-sized room, though you get a fair amount of fisheye distortion in smaller spaces. The camera defaults to 720p, but I toggled up to 1080p for comparison. Both resolutions delivered a vibrant, crisp image but there was significantly more live video lag in Full HD. Night Vision, which switches on automatically in low light, provided good contrast and detail. There’s even a “window” setting you can activate when using the camera with the window mount, which turns off the infrared LED to avoid reflection in the glass. The Logi Circle app will be familiar to users of the original Circle. The camera streaming feed displays in full-screen, with a chronology of time-stamped motion detected events down the right side. These events are denoted by colored “bubbles” that indicate how much activity was detected: gray for moderate and blue for high. You tap one to view the captured video of the event. 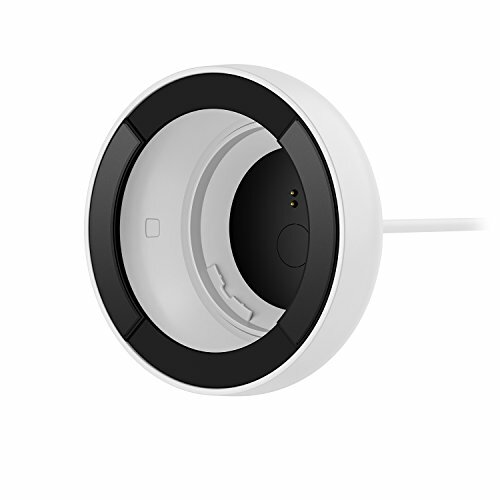 The Circle 2 can distinguish between human and non-human movement. My favorite feature of the original Circle was the Day Brief—a time-lapsed compilation of the day’s videos you could generate with the touch of a button. I’m happy to say it still has a spot at the bottom of the timeline. My main complaint with the first Circle was that it lacked the advanced security features and customization options of its price peers. That has been largely rectified, though you need to pay for a Cloud Safe Premium subscription on top of the price of the camera to access them. Perhaps the best of those is Person Detection. The feature, which can be toggled on and off, distinguishes between humans and non-humans moving within the camera’s field of view. The algorithms behind these types of features aren’t foolproof, but the Circle 2’s implementation was accurate 99 percent of the time. Only once during my testing did it misfire, incorrectly identifying one of our cats as a homo sapiens. 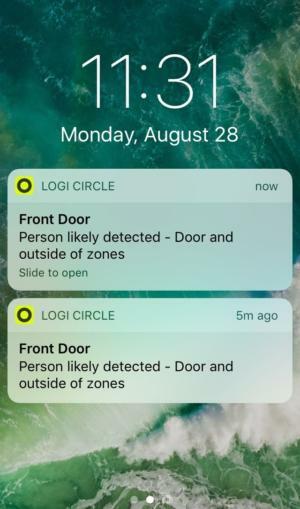 Event detection alerts also now include a snapshot of the triggering event or scene pushed straight to your device’s home screen, so you don’t have to open the Circle app to determine the notifications urgency. Circle Safe Premium subscribers receive a zoomed-in snapshot with any Person Detection notification. Another welcome addition is smart zones, which allow you to restrict motion detection to specific areas, such as around doors and windows, by defining a box over those parts of the image. Most cameras have you do this by either selecting squares on a grid overlay or by manually drawing a rectangular shape around the area. Circle 2 uses the second method, but allows you to customize the shape by grabbing the handles on a bounding box so you can contort it into any number of geometric shapes. This makes it a lot easier to narrow your detection areas by shaping them around furniture and other obstacles. You can only set motion zones using the Logi Circle web portal, though, not in the mobile app. Advanced event and alert filters are the third perk of a Circle Safe premium subscription. These comprise several options regarding what you’ll be notified about and how often. You can tailor the frequency of your notifications to be every one, 15, or 30 minutes, opt to receive alerts of high activity only, and use geofencing to automatically deactivate alerts when your GPS detects that you’re at home, among other features. A window mount, sold separately, allows you to monitor the outdoors from the inside of your home. The Circle 2 also introduces smart home integration via Logitech's POP Smart Button and Amazon's Alexa. I used the latter to tell the camera to turn on and record video, and it worked without a hitch. It’s a little disappointing that you have to pay for a premium cloud subscription to take advantage of what are often standard features—other cameras like the Neatmo Presence and Honeywell Lyric C1 include motion zones and smart motion detection in the their price—but whether that’s a drawback is best decided by your budget. There’s no knocking the camera’s capabilities. The Logitech Circle 2 successfully addresses all the shortfalls of the original Circle. Where its predecessor felt like little more than a life cam, the Circle 2 is a bona fide security camera that can go toe to toe with the strongest models in the class. Editors' note: This review, originally published September 8, 2017, was updated on May 1, 2018 with details on Logitech's new subscription plans. TechHive's editorial policy is to not change our original review score after publication unless there was an error in our original review. 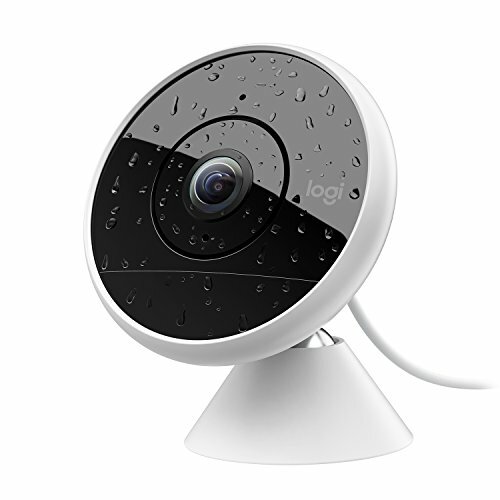 The Logitech Circle 2 (wired) is an impressive upgrade of the original Circle camera.